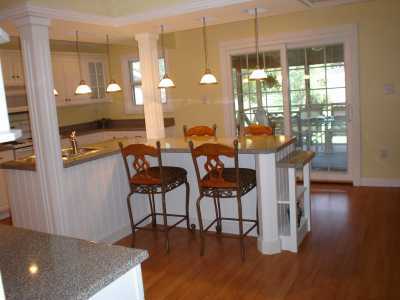 Search 1 Somerset private vacation rental riverfront rentals in Somerset, Kentucky. Vacation Villa Homes proudly presents Spencer Place, a luxury condominium situated within Woodson Bend Resort. Woodson Bend Resort is located on a scenic 455 acre peninsula high above and surrounded by Lake Cumberland. This condominium was completely renovated in 2005 to include hardwood floors throughout, washer, dryer, new appliances, three bedrooms and two baths. It overlooks the sixth green of the golf course and has plenty of parking. The master bedroom has a queen-size bed with a flat screen TV, pedestal sink and custom tile stand-up shower. Bedrooms #2 and #3 each have two twin beds.